René Gruau is responsible for the most iconic fashion images of the 1940’s and 50’s. Throughout his career he illustrated for Balmain, Balenciaga, Lanvin and Givenchy, essentially altering the way luxury fashion was advertised. His most memorable partnership was with Christian Dior, whom he worked with for almost 40 years. Dior Illustrated will celebrate this and feature over forty original illustrations for Christian Dior Parfums, sketches, magazines and poster adverts created by Gruau. John Galliano has also personally chosen a selection of Dior Haute Couture dresses for the exhibition, stating, “To be inspired by Dior is to be inspired by René Gruau. 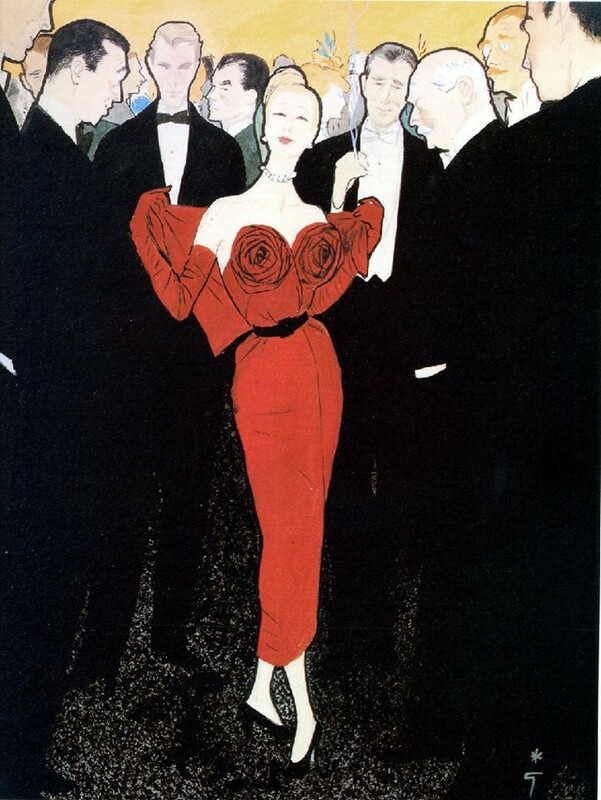 His illustrations are timeless, ever youthful, ever faithful to the moment he saw; they capture the energy, the sophistication and daring of Dior, and equally are a token of an enduring friendship”. Dazed Digital spoke to Claire Catterall of Somerset House who worked alongside the show’s curator Vincent Leret about the timeless charm of Gruau’s work. Dazed Digital: Why did you decide to exhibit the work of René Gruau? Claire Catterall: Dior approached us and said they would love to hold an exhibition of René Gruau’s prints. So we went over to Paris to have a look through their archive and were so overwhelmed by what we saw. DD: Did you work very closely with the Dior team for the exhibition? Claire Catterall: Yes they were very much involved. Vincent Leret, who is the archivist for Dior, curated the exhibition. He is the René Gruau expert and has chosen all of the images and illustrations that are in the show. We have worked with them to shape the exhibition and have helped him with the text and arranging the works in a narrative way. We have also worked very closely with Dior on the design of the exhibition. DD: What fascinated you about Gruau’s work? Claire Catterall: He was very unusual because he loved working with advertising and that was very uncommon at the time. His work really comes alive as soon as it comes into print. I mean we have all of the original illustrations in the exhibition, which are absolutely beautiful, but what I find really interesting is when you see them in print - they jump out of the page at you. He was certainly different from all of his peers in that respect. Claire Catterall: I think what is interesting is that Gruau continued to illustrate for Dior throughout the 60’s and 70’s, right up to the 80’s when fashion photography was taking over. I think this goes to show how powerful his images were and is testament to the strength of his style. DD: Your also exhibiting the work of five UK-based illustrators, how did you feel their work interacts with Rene’s? Claire Catterall: Yes that’s right. We thought it would be a nice way to bring the exhibition up to date. I mean, Gruau’s work is so contemporary and modern, and he has had such an influence on all of the illustrators we know. We weren’t expecting him to be so well know, but actually as soon as we mentioned we were doing the exhibition everyone said he was their favourite illustrator. We began to realize how influential he was and thought it would be a really great ending to the exhibition to give illustrators a chance to thank him. DD: How did you go about choosing the five illustrators? Claire Catterall: We gave Dior a long list of about 13 artists and we would have been happy with any of them. They then chose the final five, which are Jasper Goodall, Daisy Fletcher, Erin Petson, Richard Kilroy and Sarah Arnett. DD: Finally, can we expect another fashion-based exhibition from Somerset House? Claire Catterall: Yes we are rather fond of fashion exhibitions. However, we do try and mix it up a bit and continue to present graphics, design and architecture alongside fashion.